Hazelnuts, walnuts, almonds, peanuts, cumin, coriander, coriander, cumin, fennel & sesame seeds are all toasted individually then blended to form the base of this wonderfully aromatic & extremely versatile dish. It would be cheaper to fill it out & use a majority of sesame seeds but that’s doesn’t taste as good, so more than half the ingredients in ours are whole nuts, toasted & crushed by us to the texture we want. In fact, the best traditional recipes use a majority of hazelnuts in the blend so, guess what, we do too! Use as a crust for lamb or fish, sprinkle a spoonful on soup to give texture & spice or with bread & oil (our fave! ): dip a chunk of bread into nice oil and then into the Dukkah & enjoy! Makes a perfect lunch or part of a tapas / meze selection and a great alternative to ‘chips & dips’ at a dinner party. Dukkah is huge in Australia & New Zealand & we always make sure we get our friends from down under to taste ours when we talk to them at our events. 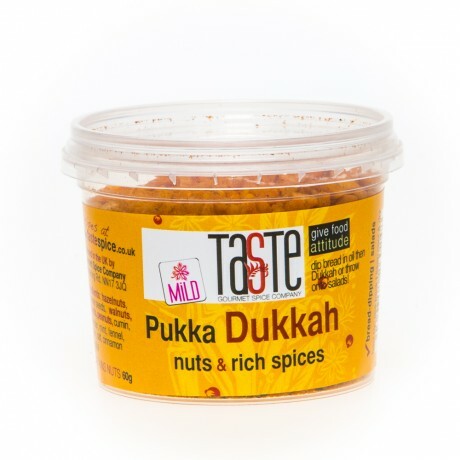 So far, everyone has loved it which is a real compliment to our Pukka Dukkah. Because if the experts love it – you will too!